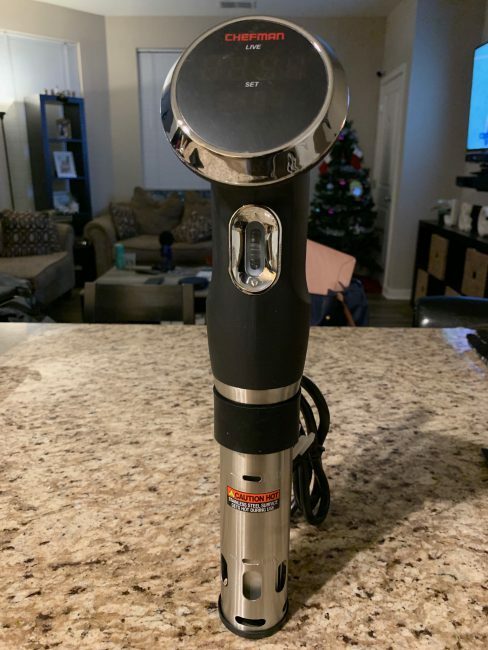 Combined with the Chefman Sous Vide App, the Chefman Sous Vide is the least complicated kitchen item that you’ll use to cook your meals. The immersion cooker’s premise is simple: You place the sous vide into a water bath with your foods in a vacuum sealed bag (or Ziploc if you don’t want to pay an additional fee for those bags on Amazon) to cook your meals evenly. 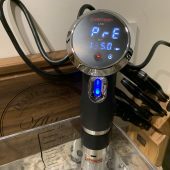 In my practice with the Chefman Sous Vide, I’ve cooked everything from cuts of chicken, beef and even salmon for my wife, and she’s compared the results to restaurant quality thanks to using this method. Prior to using the Chefman Sous Vide we would place our meals in the oven and let them cook that way. But constantly going over to the stove, turning the light on to check the progression of our meats, using thermometers to see if the middle of the food were a certain temperature is a thing of the past. With the Chefman Sous Vide now we simply drop our bag into the water and control everything else through the app. 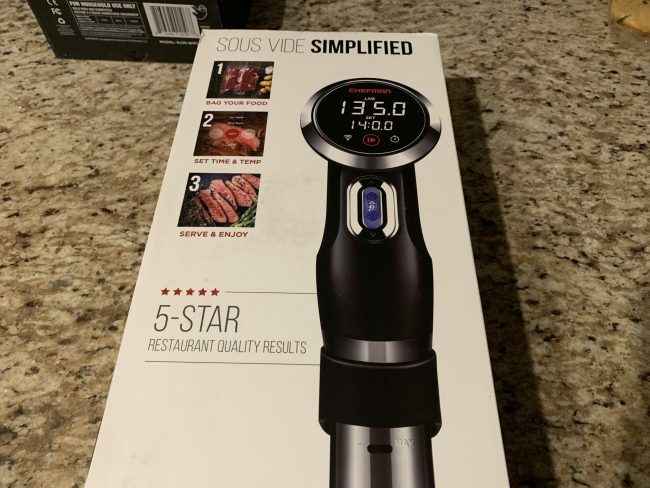 The sous vide itself does all of the work courtesy of a 360-degree directional pump and an LCD display that has smart sensors built-in to monitor the water temperature levels. 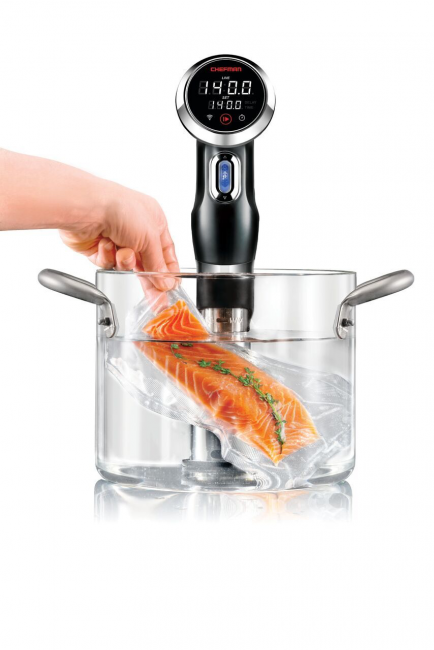 At the back of the sous vide there is a clamp that allows you to set the sous vide on the side of a pot. Alternately you can use a clear container (you can purchase one on Amazon), so you can monitor your foods without having to lift them from a container to see them. What’s truly great about the Chefman Sous Vide for me though is the included recipe book that gives you ideas of meals to cook if you’re into learning new meals. 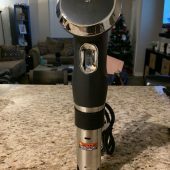 I plan on making poached eggs with my sous vide in the future. What’s worth mentioning about any sous vide is what to do with the meats once you take them out of the bag. Let them rest for 2-3 minutes, then giving them a quick pat down with a paper towel before searing. I sear all of my meats and veggies with a culinary torch to give them a bit of texture, similar to how restaurants do it. With the Chefman this makes it even easier as compared to stove top cooking, where your meats will cook on the surface and eventually burn. 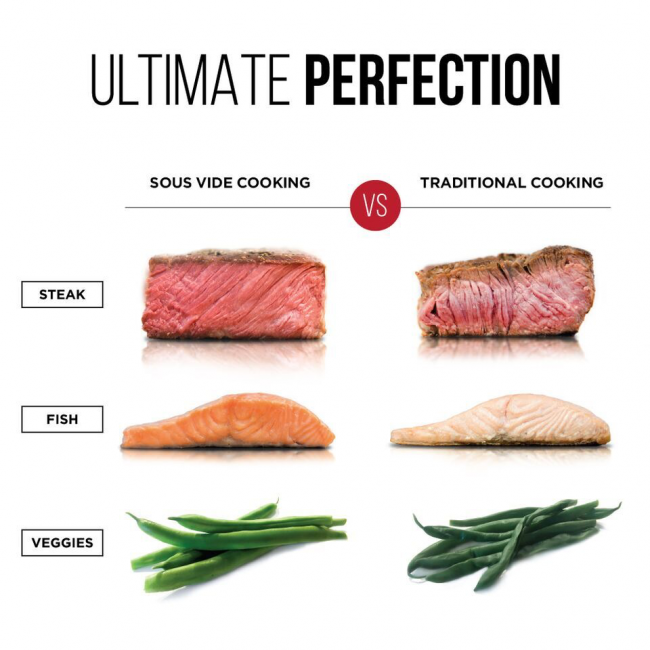 By using the Chefman, the Sous Vide method locks in juices and flavors. Which means anything you place into the bag including herbs and spices won’t just have the taste from the outside of the meal but throughout every single bite. 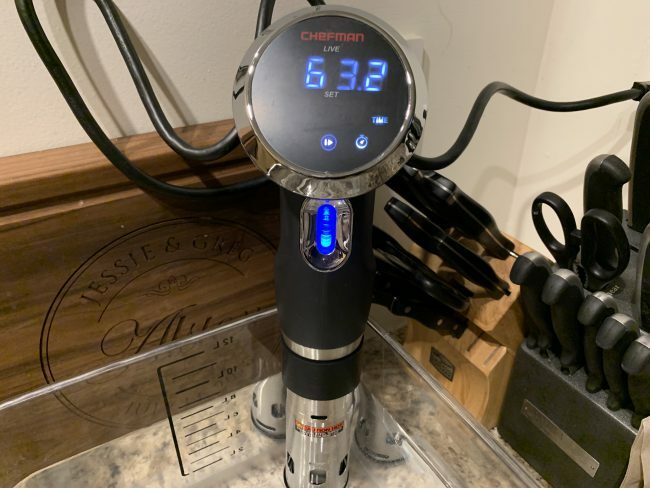 I personally love the Sous Vide method of cooking, and Chefman’s Sous Vide Circulator is the best ingredient to a perfect meal — and it’s not even an ingredient. It’s as simple as placing food in a bag, setting the temperature and time and then enjoying. 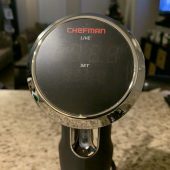 For more information about the Chefman Sous Vide, head over to Chefman’s site. What Needs Improvement: takes up a lot of drawer space due to size.